In my opinion, it was quite successful at encouraging this style of play. As a result, I’ve always found the design, which was also quite simple and concise, to be very inspiring. 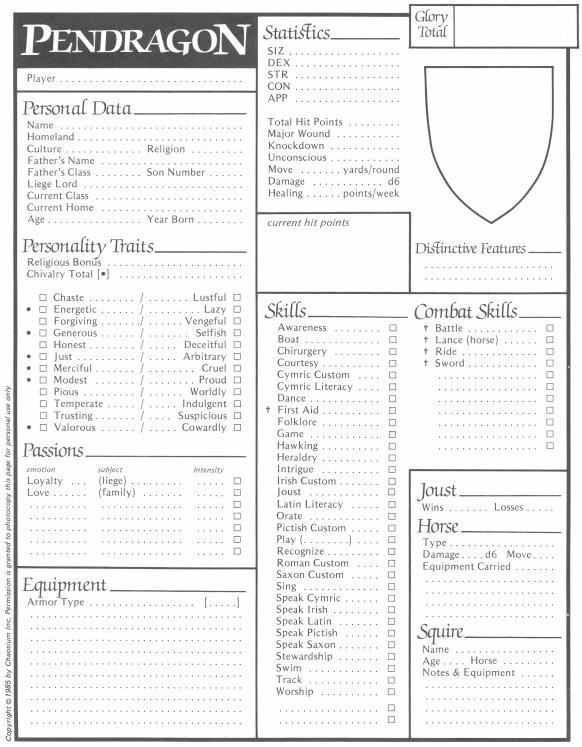 The basic character sheet for Pendragon hints at the simple elegance of the rule system. Lots of white space, and yet with a pretty detailed list of game elements and characteristics to be determined. One detail worth special mention: notice how the physical characteristics and personality traits are arranged to give them almost equal importance, with Strength and the like being top of page, but off to the right, and traits being left edge/first column, directly beneath name and personal data. This mirrors some of the different emphasis in the game play itself, a neat little design trick that helps the player focus on the desired elements of play. The 12 personality traits work a bit differently. The right hand scores are determined by 3d6 roll, with modifiers applied for traits considered virtues by the character’s chosen religion (Christian, Wotanic, Pagan). The opposing traits in each pair are then set to 20-that score. For example, a character with a Modesty trait of 7 has a corresponding Pride trait of (20-7=) 13. In addition to personality traits, characters will have a selection of “passions” to deal with as well. 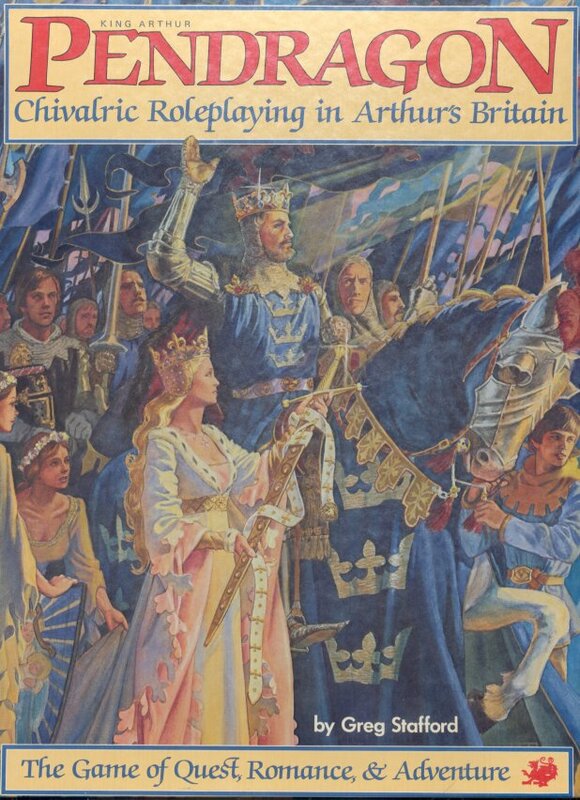 The basics of Loyalty to one’s liege, and Love for one’s family are constant to all characters in Pendragon, but others can be added at the start, or earned over the course of play. These can include other Loyalties (to the Round Table, to one’s vassals), Loves (spouse, diety), Amor (chaste love, carnal relations make it a Love instead), Hates, and Fears. These get rated on a 1-20 scale, and can be used in play to Inspire the character to exceptional levels of performance (in the right circumstances). Passions also feed into the Glory system, which is one of the character development systems… anyone looking to advance in the game is going to want a Passion or three to play through and struggle with. Advancement in the Pendragon system is a once-a-year event, occurring in the game fiction during the Winter months of (frost-enforced) isolation and contemplation. There are essentially two components to the advancement model. First, any skills, traits, and/or passions that were significantly tested during the previous year can be raised by a point if the player rolls higher than the current score on a d20. Obviously, the maximum score achievable in this way is 19. Glory allows the opportunity to exceed that limit. Every 1000 points of Glory earned allows the addition of 1 point to an attribute, skill, trait, or passion, beyond the normal limits which can have additional benefits beyond simple improved chance of success. For example, a skill score in excess of 20 (which is an automatic success, skill tests being a matter of rolling less than current skill on 1d20), grants the character complete avoidance of critical failure. Normally a roll of 20 is a critical failure and a roll of exactly the current skill score is critical success, but with skill of 20+, 20 is critical success and there is no chance of critical failure. In addition, the difference between the score and 20 is added to the roll, effectively extending the chance of a critical success since any roll of greater than 20 is treated as 20. Extending a trait beyond 20 indicates a level of virtue/vice that is impenetrable, attributes can be increased to super-human values, and so on. Glory can be earned by many actions of the character: knightly challenges, tournaments, slaying of monsters, in battles of armies, through completion of quests and earning of honors, etc. Glory can also accrue annually during the winter based on landholdings, income, significant passion scores (16+), and so on. The rules are relatively detailed, and a wide selection of possibilities for gaining Glory are mentioned. Pendragon, done right, offers a very different type of experience to those who play it. The focus from the beginning is on social interaction and personal motivation, as opposed to XP and gold pieces, and the system successfully creates a reward paradigm that reinforces that difference. Spending a session on a quest to retrieve a flower to win favor from a knight’s amor would not be unusual. Hedge witches, fae monsters, blank shield knights, tests of both virtue and courage… what more could a true knight ask for from a midsummer’s jaunt? Pendragon is another Chaosium property that has changed hands a couple of times over the past 20 years. For some time, it was a product of Green Knight Publishing (http://www.greenknight.com/products/rpg/index.shtml). In late 2004, White Wolf Publishing appears to have bought up Green Knight, releasing a 5th Edition version shortly thereafter. However, there has been some recent activity at the Green Knight website, and with the recent merger of White Wolf and CCP Games, the developers of the MMO Eve, it is anyone’s guess what is going on with the various “acquired” WW properties (the Arthaus subsidiary in particular) at present, Pendragon included.